So we begin anew! With John Peters of Gypsygirl Press as our new artist, and Fes Works as the colorist, we start our weekly update schedule! Right now we are rebooting the comic, starting with The Road Trip, originally written and drawn by Jason Dunstan (Ardra’s Creator). The story went through a major rewrite by Fes, tweeking a few things, and bringing it home for a definitive introduction to Ardra! After that we’ll rework other earlier stories, and prep it all for print! Again, if you were not aware, the previous artist, Trevor Adams, could not continue with Ardra because of his work and life in general. We of course thank him for all of his hard work in the past! You can still read the 200+ comics of Ardra in the OLD Archive! 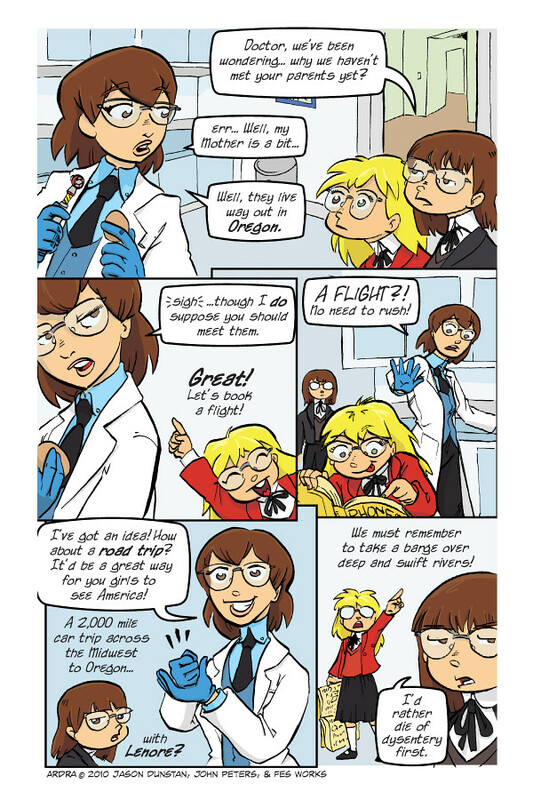 Posted on September 13, 2010 at 1:26 am in Comic2, Uncategorized and tagged with Ardra, Eileen, Lenore. Follow responses to this post with the comments feed. You can leave a comment or trackback from your own site. On a side note, how many versions of this same page drawn by different people now exist? Three? Four? A lot anyway. I think it’s three versions, if you don’t count the one where Ardra doesn’t answer right away because of an overwhelming feeling of Deja Vu. The other two can be seen in the archives, but not the Deja Vu one since I haven’t drawn it yet. The first three “Road Trip” strips are the Ardra equivalent of “Groundhog Day”. Looked up dysentery once. Ick. It’s a reference to the old Oregon Trail PC game… actually all of the last panel is. 1 of the things she’s holding looks like a bit like Dr.Who’s Sonic Screwdriver.